One of my favourite soups is roasted garlic and tomato (the roasting deepens the tomato flavour) but when I have really good vine tomatoes I want to make the most of them with a fresh tasting soup like this one. Sauté 2 or 3 chopped garlic cloves for a few minutes in a generous amount of good extra virgin olive oil. Add quartered tomatoes and a little fresh thyme. Cook until the tomatoes start to break down, then blend until smooth. Sieve the soup and season with salt. Heat through before serving. Why do people refrigerate their tomatoes? It ruins their flavor and texture. It’s a crime! And be sure to let your tomatoes ripen to the point they should before eating. 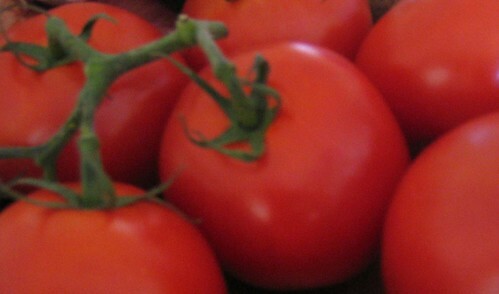 Eating an under-ripened tomato is akin to drinking wine a week after it’s been bottled. Yes, I am an enormous tomato freak. Thanks for listening.